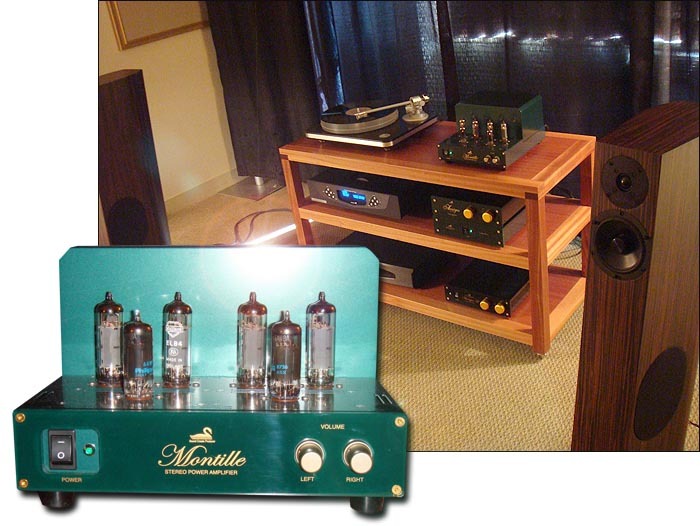 The Red Wine Audio/Omega Loudspeakers/Hudson Audio room offered an off-the-grid system featuring Vinnie's long anticipated Isabella preamp ($4,000) which features a pair of 6922 valves and an optional non-oversampling DAC ($1,500). Red Wine Audio's new Signature 30.2 stereo amp ($2,100) drove Omega's Super Hemp (aka big fatties) speakers ($1,995) with optional Alnico drivers. Sources were Scheu for analog and a MacBook for digital. Hudson Audio also displayed their line of affordable cables. And here again were Noel speaker stands. It was difficult to get a sense of the Isabella's sonic contribution but listening to WAV files played back on his MacBook via the Isabella sounded far better than what I normally experience when attempting to integrate a PC into my system. Maybe I need an Isabella? After the show I asked Patrick to pick one overall favorite room and he chose this one without hesitation. I asked why and he replied that he loved how Linkin Park sounded, especially the guitars. He said other speakers either smoother over the edges or sounded too bright and thin. Louis' speakers made the guitars sound more real. He also said that these guys are fun to talk to and take him seriously and don't treat him like a kid. I think there's a lesson to be learned here, dontcha think? I remarked to Louis that every time I see Omega and RWA at a show, I notice a consistent improvement not only in sound quality of their components but also appearance. It's difficult not to like these guys or knock their enthusiasm. It's been a real pleasure watching them grow and develop. Btw, looks like Patrick and I will be reviewing Omega's upcoming 6" Alnico Hemp equipped speaker later in the year. 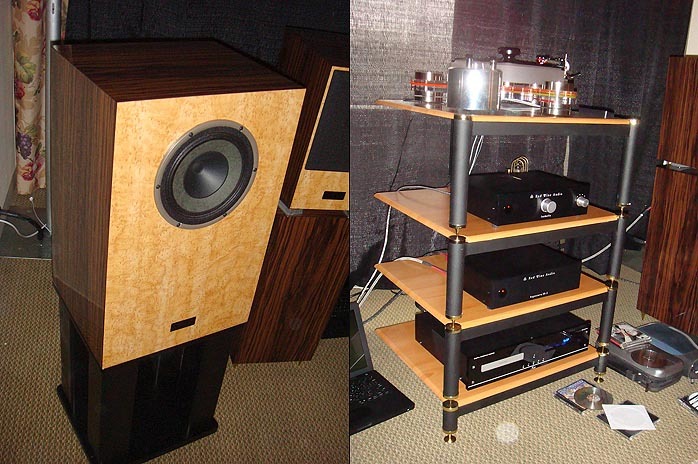 Norvinz showed a rather lovely system built around what is still my overall favorite single driver speaker - Robert Lamarre's RL Acoustique Lamhorn 1.8. Also featured in this rig were TBI Magellan VIP subs, Opera Audio Consonance Cyber 211 monos, Vacuum State pre. 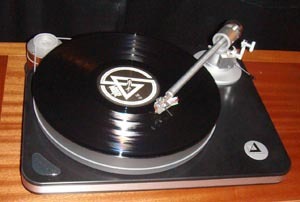 Analog source was a Merrill-Scillia MS2 turntable w/Ortofon RS212-D tonearm & Ortofon SPU cartridge. Digital front end sported an Opera Consonance CD-120 CD player and Benchmark DAC. Gingko Audio Cantare SC, Luminous Audio Synchestra & Anti-Cables IC and Gingko Audio's Mini Clouds completed this fine setup. Unfortunately I was unable to spend more time in this room but I liked what I heard. Montreal retailer Coup de Foudre had several rooms at the show. My favorite two shared with Tone Imports featured Leben HiFi's CS-600 integrated driving a pair of ProAc Response D Two speakers while the other sported a pair of Audio Physic Virgos driven by the lovely EL84-powered Shindo Labs Montille & Aurieges preamp combo. Patrick was also impressed with how natural and sweet this rig sounded. 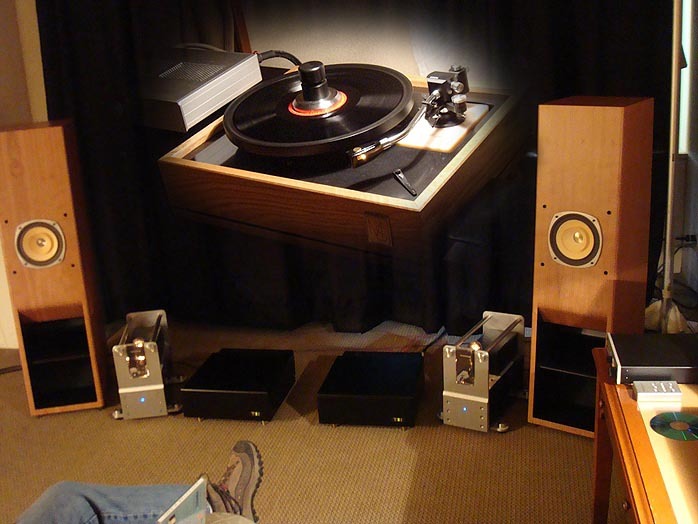 The turntable was Clearaudio's new Performance and digital was via Audio Aero. Speaker cables were the Auditorium 23 which I own and quite enjoy. The little Montille had no difficulty with Patrick's Linkin Park LP. I don't think you could rattle the windows with this system but it sure conveyed the musical message. On static display was 'the one that got away' Leben CS-300X I reviewed a few years ago. I would have bought that amp if I could have afforded it at the time. Man, I miss that little gem. As in the past, this show was well organized and a breeze to navigate. Kudos to Michel Plante and his friendly staff. Attendance seemed pretty good with plenty of crowded rooms that were sometimes impossible to enter. 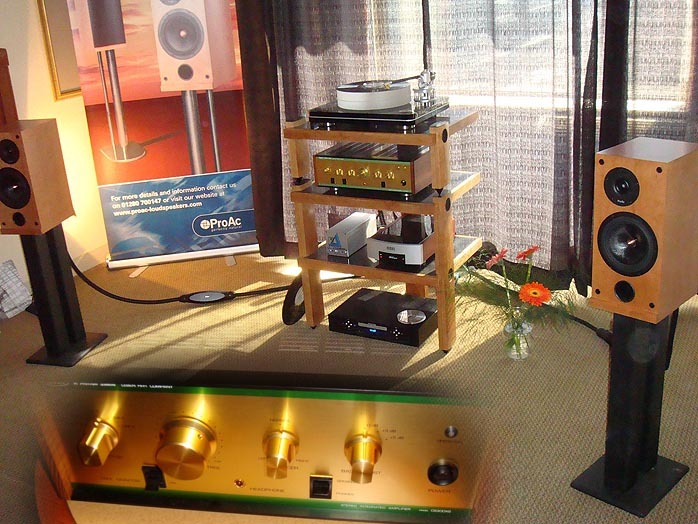 No doubt having Stereophile sponsor the event this year only helped to draw interest. This annual event has a great vibe and is the only one of its kind in Canada and I hope it continues. Disappointments? Other than watching the Canadiens de Montreal put a swift end to the horrible train wreck that was the Toronto Maple Leafs' season, this weekend was a blast.